MRML has lauded the work of Rock Star in-waiting Mike Koop before. We've praised his sidemanship in The Bonaduces, his role as power-pop singer-songwriter in The Kicker and his Dylan covering alt-gospel ex-plosion, Multitude of Sins at length. 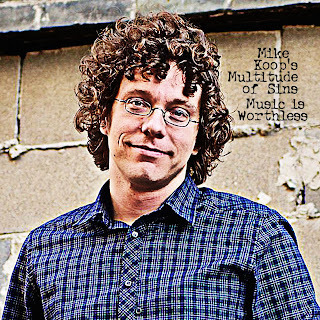 Now Koop has just released his first solo album, Music is Worthless, backed by the aforementioned Multitude of Sins. I could go on at length but I already wrote the damn liner notes for the album, so I'll let the songs sing for themselves. Here's Koop covering Bob Dylan's "Pressing On", Social Distortion's "Ball and Chain" and lest you think this is an album of covers (it is certainly not) here's Koop's composition, "Save Me ". For those of you who've missed out on the frequently downloaded (over 500 time before the links went down!) 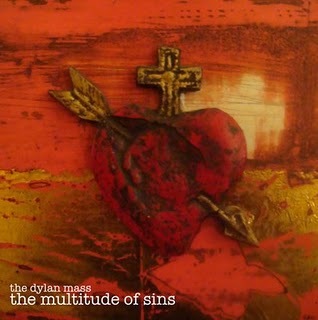 but rarely commented on Dylan Mass (Koop and his MOS doing six Dylan covers) please check out the free and legal download at the original post and PLEASE LEAVE A COMMENT! Thanks for the info and link to the Mass- Just downloaded and will play soon. What a fantastic idea an Anglican Mass- which I happen to like very much- when I do go to church, though not often, I go to anglican/Episcopalian. I'd love to see a video of this event. I wonder if one was made. the MOS album cover is gorgeous. I'm downloading the Multitude of Sins. Will let you know what I think. If I don't, then feel free to bug me. Thanks for your thoughtful words, always a pleasure! Can't please everyone, I suppose. Having only played on this worthless record myself, i don't have as much of a personal/emotional stake in the record as Mike would, but two(!) comments by someone going out of their way to slander someone else's project is beyond pointless. I welcome all comments (short of trolling or spamming), so you have to take the good with the bad and you have added one that falls right into the 'good' category. Should Music Blogs Carry Ads? The Gits: Spear & Magic Helmet 7"